Unlike other American Statistical Association journals, the Journal of Statistics Education (JSE) does not require authors to transfer copyright for the published material to JSE. Authors maintain copyright of published material. Because copyright is not transferred from the author, permission to use materials published by JSE remains with the author. Therefore, to use published material from a JSE article the requesting person must get approval from the author. Dataset: "Pricing the C's of Diamond Stones," submitted by Singfat Chu, National University of Singapore. Dataset obtained from the Journal of Statistics Education (http://jse.amstat.org/publications/jse). Accessed [give date here]. Used by permission of author. 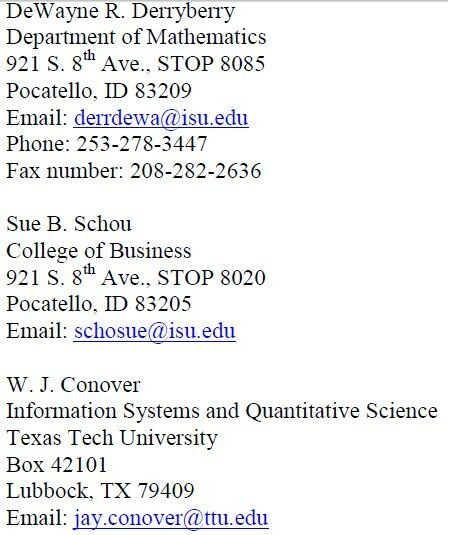 To use data sets in papers, books, or other published material you must obtain the consent of the contributing author. The JSE Editor should also be informed of the request, but the author retains the right to grant use of the data set. Note: Our preferred method of submission for papers is now Word. This allows us the maximum flexibility to put all manuscripts into a standard format, make edits, add the JSE logo, embed links, and make appropriate headers/footers. Following the edit process the manuscripts will be presented in PDF format on the website. Beginning with the March 2010 issue the Journal of Statistics Education (JSE) has gone to a PDF only format. Previously papers were stored in both PDF and HTML formats on the website. The move to PDF only was done for three main reasons: (1) The volume of papers included in an issue has increased to the point where coding up a paper for HTML is no longer feasible; (2) The HTML versions of papers do not display equations well; and, (3) New functionality in PDF makes the transition much easier than it would have been several years ago. If you open a PDF file within the web browser then an external link within the paper (such as a link to the GAISE Guidelines ) works with the back browser button just as in HTML. However, with the switch to PDF only there is some functionality of HTML that is lost. The most important change is that the back browser button does not exist within a PDF document. You cannot use the back browser button for internal links within a PDF document. However, simultaneously pressing the ALT Key and the back (left) arrow key acts very similar to the back browser in HTML for internal links. What follows is a quick step-by-step for how to read the PDF only documents. Open the PDF version of the paper "Teaching Rank-Based Tests by Emphasizing Structural Similarities to Corresponding Parametric Tests" by DeWayne R. Derryberry et. al. The paper is at http://jse.amstat.org/v18n1/derryberry.pdf. A screen shot of the first page of the paper is given below. Notice the authors' names are highlighted in blue and underlined. Click on DeWayne R. Derryberry's name. You are taken to the end of the paper where the author contact information is given. A screen shot of the author information page of the paper is given below. To return to the beginning of the paper hold down the ALT Key and press the back (left) arrow key. This should return you to the beginning of the paper. The PDF version of a paper has links to authors' names, every reference cited in the paper, figures and tables that are referenced at multiple points in the paper, and appendices. Please email Michelle Everson, the Editor of JSE, with any comments or questions about the move to PDF only format.